Since seeing the film (twice) the week it came out in October, I’ve been entralled with the ideas presented in Cloud Atlas – in both the book (by David Mitchell in 2004) and the movie (screenplay and direction by the Wachowskis and Tom Tykwer). I hate to give too much of a movie away, so I will simply encourage you to see this film if you’re interested in stories that mix genres and challenge your perception of the world. It’s also the fastest-paced 172-minute film I’ve ever seen. I’m currently a few chapters into the book, so I can’t say too much about it other than that I’m amazed by the heartfelt dialogue. 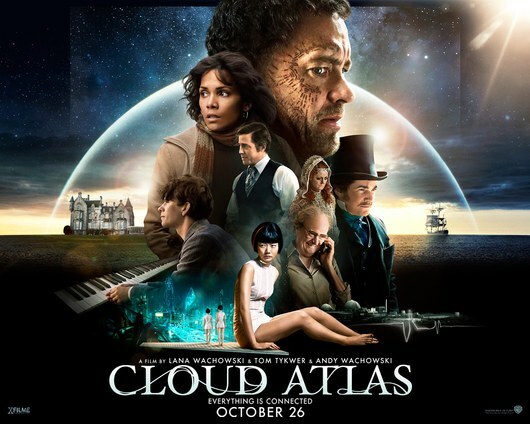 Cloud Atlas explores how the actions and consequences of individual lives impact one another through the past, the present and the future. Action, mystery and romance weave dramatically through the story as one soul is shaped from a killer into a hero, and a single act of kindness ripples across centuries to inspire a revolution in the distant future. Literally all of the main characters, except one, are reincarnations of the same soul in different bodies throughout the novel identified by a birthmark… that’s just a symbol really of the universality of human nature. The title itself “Cloud Atlas,” the cloud refers to the ever changing manifestations of the Atlas, which is the fixed human nature which is always thus and ever shall be. So the book’s theme is predacity, the way individuals prey on individuals, groups on groups, nations on nations, tribes on tribes. So I just take this theme and in a sense reincarnate that theme in another context. The Wikipedia page currently has a complete list of the different roles of every actor in the film. Here’s an extensive inside look video if you’re confused about the film.